This is a ‘slate’ (schist or siltstone) cosmetic palette excavated from grave 11727 at Mostagedda in Upper Egypt. It dates to the Naqada II-III Period (4000 B.C. – 3100 BC). More general information on these can be found in Needler (1984). Such items would have been used to grind up minerals to make eye or body make-up. It is usually assumed that it was used for eye make-up as this was used in later periods, though it may have been body paint for which we have little evidence in later periods. Some examples have traces of green malachite, a copper ore. In the later Dynastic Period, the black mineral, galena was more commonly used. While both men and women used eye make-up in ancient Egypt, it seems that cosmetic palettes such as this were more commonly placed in men’s rather than women’s graves (e.g. Ellis 1992; Hassan and Smith 2002). The excavation report on Mostagedda suggests ours was found in a child’s or woman’s grave (Brunton 1937, 87, pl. XLIII.7). 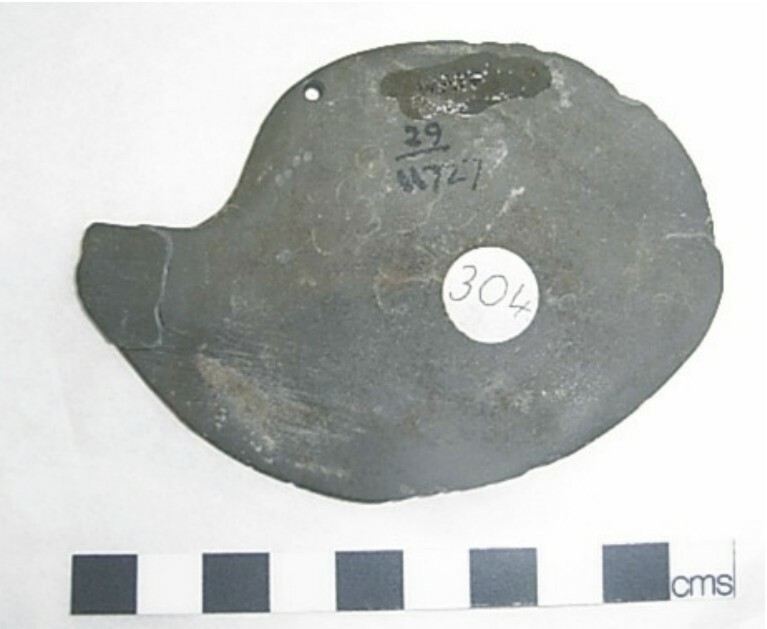 A number of siltstone cosmetic palettes were made in the shape of stylised birds, other examples are more obviously birds and some even have features such as an inlaid eye. Ours is probably a debased bird. Hassan and Smith (2002) see a connection between women and birds (as well as women and cattle) in the Predynastic Period and also suggest that the bird may have symbolised the soul at this date. Hassan and Smith (2002, 61-63) also point out the revivification aspects associated with palettes and make-up in ancient Egypt. The colour green, the colour of the eye make-up at this period, is later known to have been associated with new life by the ancient Egyptians. Make-up was not only used to protect the eyes from the glare of the sun and perhaps also from eye diseases but had religious connections. The symbolism of cosmetics explains the use of some later palettes, such as the Narmer Palette, as power symbols. W727, like others, has a hole for suspension but it is not known whether it would have been hung up within a dwelling or from an individual person. Brunton, G. 1937. Mostagedda and the Tasian Culture. London: Bernard Quaritch Ltd.
Ellis, C. 1992. A statistical analysis of the protodynastic burials in the “Valley” Cemetery of Kafr Tarkhan. In E.C.M. van den Brink (ed.) The Nile Delta in Transition: 4th-3rd Millenium BC. Tel Aviv: Israel Exploration Society 241-258. Hassan, F.A. and Smith, S.J. 2002. Soul birds and heavenly cows: Transforming gender in Predynastic Egypt. In S.M. Nelson and M. Rosen-Ayalan (eds.) In Pursuit of Gender. Worldwide Archaeological Approaches. Walnut Creek: Altamira Press, 43-65. Needler, W. 1984. Predynastic and Archaic Egypt in The Brooklyn Museum, Brooklyn: Brooklyn Museum, 319-326.